Warm weather has arrived and luckily, so has the Born Mae. This wedge sandal from Born has an upper made of full grain leather with an adjustable strap with hook & loop closure. 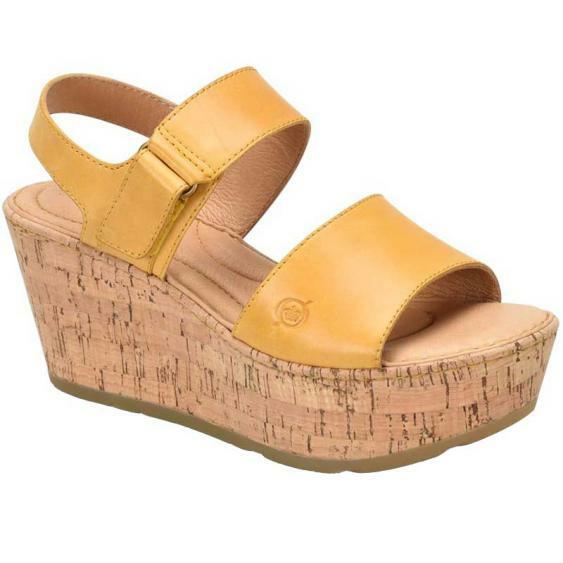 The 3” cork wrapped wedge gives it a natural look and when paired with the 1 ½” platform, you get a vintage vibe. The leather linings of the Mae are super soft against a barefoot and the leather covered foot bed is generously cushioned from heel to toe. You get added bounce back from Born’s Opanka construction which is the hand stitching process they use to create durability and flexibility. The rubber outsole of the Mae features the Born logo and provides excellent traction. Everyone needs a summer wedge and they don’t come any better than the Mae from Born.